If you are looking for a breakthrough and innovative skin treatment, the DNA CryoStem™ Skin Therapy System may be the answer for you. This revolutionary system delivers unmatched hydration and firming, erasing the signs of aging while providing free radical protection. It does so by replacing aged and damaged cells with brand new ones while training new cells to perform properly from the start. It is a known fact that with aging our DNA breaks down over time. 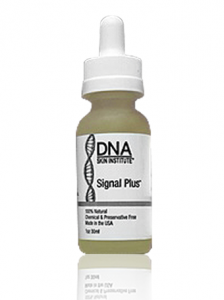 The application of pure DNA live Cryostem serum actually bonds to the skin, programming completely new skin growth. Existing skin will replicate the condition of the applied new cells, making it just as flawless. This biological reprogramming creates the perfect environment for future generations of fresh and younger skin. The DNA CryoStem Skin Therapy Treatment is supplemented by a moisturizing or lifting solution, utilizing cryogenic cell therapy. Cryogenic skin cells repair free radical damage, create a moisture-rich environment, promote collagen synthesis and encourage the production of elastin. Both men and women can benefit from this treatment. Burns; Sun, Heat, Laser, etc. The Signal line is the result of over 20 years of clinical use, clinical observation, and used by elite medical professionals worldwide. targeted sequenced signaling factors all without the use of any chemical additives. 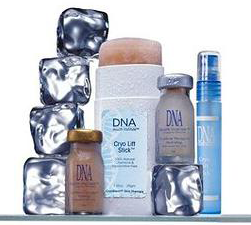 All DNA skin products are 100% natural preservatives and chemically free.